The peachy pink morganite is innately one of the most romantic gemstones that we offer at deBebians. Morganite is said to promote prosperity of love as well as an abundance of heart. It also symbolizes joy and inner strength, which makes it the ideal gemstone to gift to someone that you care about. We have a stunning array of morganite jewelry that would be perfect to give for any special occasion–including a wedding anniversary or birthday. If you are looking to propose, we have an impressive collection of rose gold engagement rings that feature a morganite center stone. The light pink stone is enhanced by the warm hues of the rose gold. 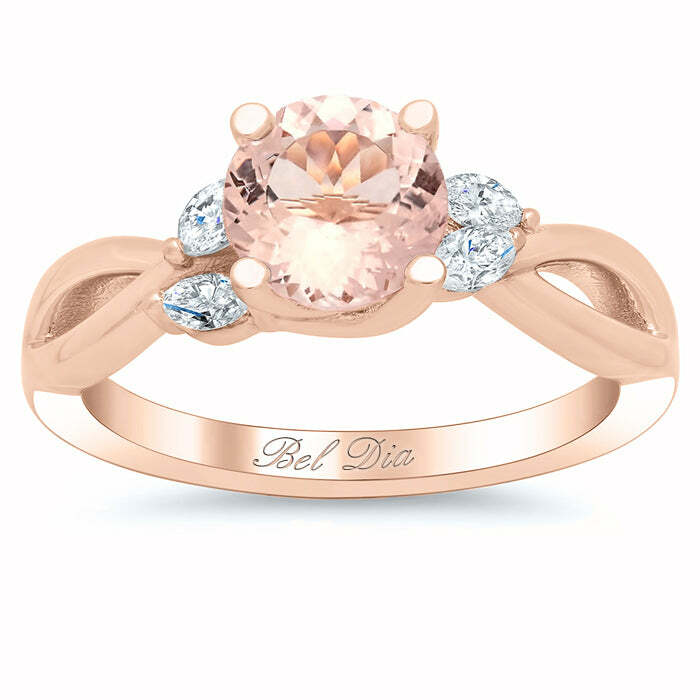 Choose the style that best suits her, such as this morganite vine twisted rose gold engagement ring. 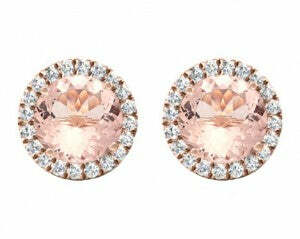 Our morganite diamond halo stud earrings would easily become a favorite piece of jewelry for her to wear. The natural morganite is surrounded by sparkling, white diamonds. To complete the set, you can purchase our matching diamond halo morganite pendant now or at a later date. These pieces are so luxurious; they can be worn with either simple or extravagant attire. Please let our jewelry experts know if you have any questions. With its beauty and peachy color, it is easy to see why this gemstone continues to grow in popularity. View all of our gemstone jewelry by checking out our gemstone jewelry guide.